Chief Rabbi of Israel Yitzhak Yosef, former Chief Rabbi of Hevron Dov Lior, MK Yehuda Glick, ex-MK Moshe Feiglin on Hamas hit list. 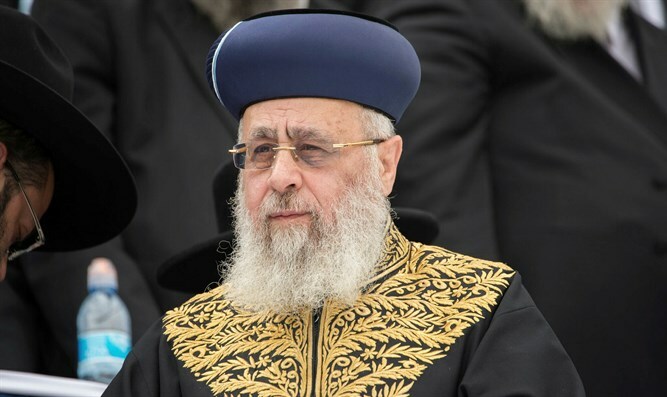 The Hamas terror organization publicized an apparent hit list of Israeli rabbis and politicians on Wednesday, at a memorial event for the terrorist responsible for the murder of Rabbi Raziel Shevach in Samaria. Early Tuesday morning, Israeli security forces shot and killed Ahmad Nasser Jarar, the terrorist who led the fatal attack on Rabbi Shevach last month near the entrance to Havat Gilad. At a memorial service for Jarar, Hamas placed a placard of Jarar next to a series of photographs of various Israeli rabbis and politicians. Among the rabbis included in the display were Rabbi Raziel and Rabbi Itamar Ben-Gal, the 29-year-old Har Bracha resident who was stabbed to death by an Arab terrorist in Ariel on Monday. The pictures of both of the murdered rabbis were covered by a superimposed red ‘X’. The other figures included in the display, which was an apparent hit list of Israeli Jews, were Chief Rabbi Yitzhak Yosef, former Hevron Chief Rabbi Dov Lior, Rabbi Nir Ben-Artzi, Likud MK Yehuda Glick, former Likud MK and Zehut party chairman Moshe Feiglin. Feiglin noted that despite Hamas’ clear support for terrorism, the Israeli government was still working to secure aid for the Hamas-ruled Gaza Strip. “It is so ridiculous to think that [Israel’s] Defense Minister is running around Europe trying to collect money [for Gaza], and the [Israeli] Prime Minister is working to convince Trump to continue funding an organization [referring to US funding for UNRWA in Gaza] that explicitly declares its desire to murder me,” Feiglin said according to a report by Israel Hayom.